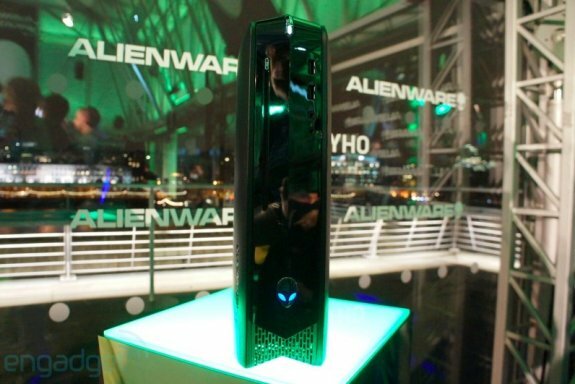 Engadget snapped pictures of Alienware's new X51 gaming PC, you can check it out over here. The system is about the size of the original PS3, and at $700-$1,000 it's surprisingly affordable for an Alienware rig. The rub? Gameplay was smooth, with the same vibrant graphics you'd expect for a PC kitted out to last beyond the current crop of Sony and Microsoft hardware. Our efforts were more hampered by the Razer Onza controllers, on which which we struggled to unleash our hadoukens. We also had a brief stint on Portal, which, although no graphics powerhouse, also ran untroubled. The Core i3 X51 will set you back $699, with a GeForce GT545 graphics card. Anyone willing to pony up more cash for the Core i5 and i7 models, you can expect to pay somewhere between $700 and $1000, with a grand netting the top-drawer model. The chance for a strong debut entry into PC gaming, minus the toying-with-internals rigmarole, could tempt some previously console-only gamers to get their wallets out.